September 12, 2010 by rwb, under Microcontroller. With this circular shift register connection between the SPI master and the SPI slave devices, the complete data transfer from both devices will be accomplished in just 8 clock cycles. This means the SPI devices only need about 0.8 us to complete transfer the 8-bit data if we use 10 MHz clock. One of the drawbacks using the SPI especially when we use multiple SPI slave device is the SPI slave could not initiate sending its own data to the SPI master device, all the data transfer initiation is always come from the SPI master. The SPI master device has to poll each of the SPI slave devices to know whether the SPI slave device has a data to be sent to the SPI master device or not. Polling the entire SPI slave devices will eventually consumed the SPI master resources when the SPI slave devices to be polled increase, therefore some of the SPI slave device is equipped with the interrupt pin to notify the SPI master device that it has a data to be read. You could read more about how SPI work in my previous posted blog Using Serial Peripheral Interface (SPI) Master and Slave with Atmel AVR Microcontroller. On this tutorial I will use the Microchip PIC18F14K22 microcontroller, this microcontroller is one of my favorite 8-bit 20-pins PIC18 microcontroller families members as it is equipped with sophisticated advanced peripheral inside such as ADC, USART, ECCP (Enhanced Capture/Compare/PWM), SPI, I2C and the SR Latch (555 Timer) module for capacitive sensing. With 16K bytes flash ram and equipped with the build in circuit debug, this 8-bit 20-pins microcontroller is a perfect choice for serious embedded application or just for hobbyist’s project. The PIC18F14K22 microcontroller SPI peripheral support both master and slave mode but on this tutorial we will only exposing the PIC18F14K22 SPI master mode where on the first part we will expand the PIC18F14K22 microcontroller I/O by using the SPI I/O expansion chip and the second part we will turn the PIC18F14K22 microcontroller into a very useful SPI device testing tools that could be used to test and debug most of the SPI device chip available today. Both of these projects will give a good understanding and experience of how the PIC18F14K22 microcontroller SPI master peripheral works. Microchip PICKit3 programmer (used in this project); you could also use the Microchip PICKit2 programmer. The Microchip MCP23S17 SPI I/O expander will give you additional of 16 I/O ports where all the 2 x 8-bits general purpose I/O ports (GPIO) could be configure both as output or input. The MCP23S17 IODIRA and IODIRB I/O direction register is used to control the I/O direction for GPA and GPB respectively. 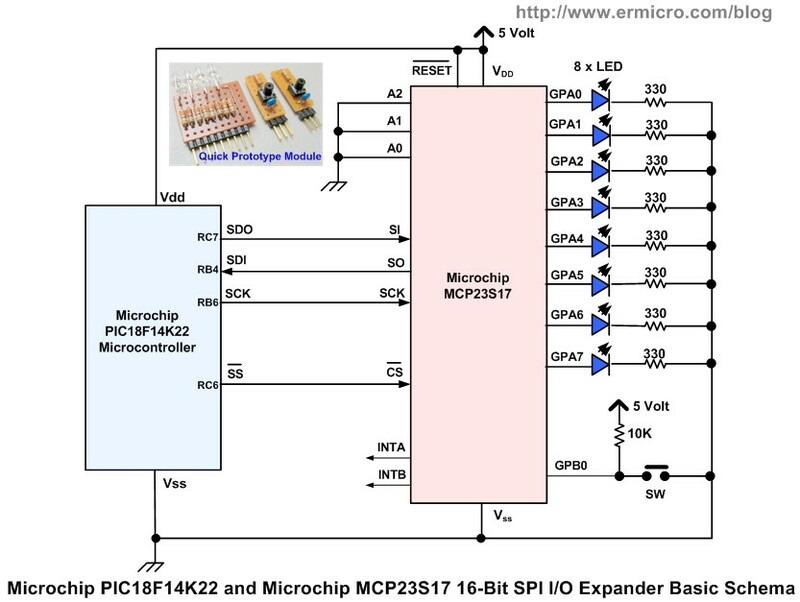 One of the unique features of the Microchip MCP23S17 SPI I/O expander is in its configurable address capabilities. By setting the needed address to its address pins A0, A1, and A2 we could configure up to 128 addressable SPI devices or in other world you could put up to 128 of MCP23S17 SPI I/O expander in the same SPI bus without having to have the separate CS (chip select) circuit logic for each of the MCP23S17 SPI I/O expander chip. 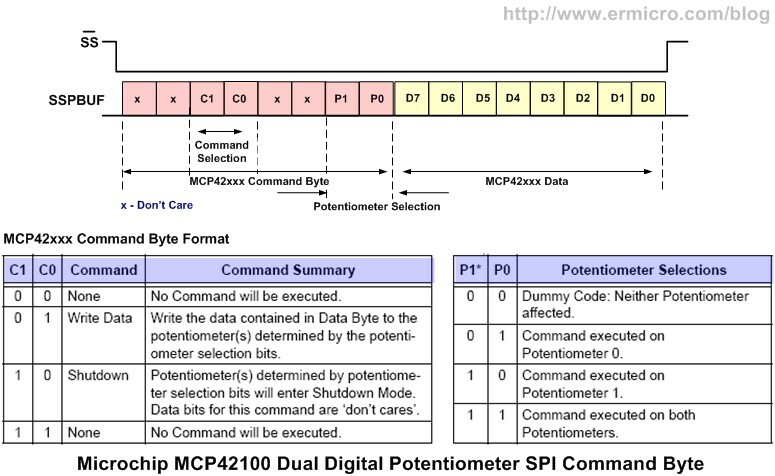 Each of the MCP23S17 general I/O pins also could be configured to generate interrupt when the ports pin changes its state (for more information please refers to Microchip MCP23S17 datasheet). 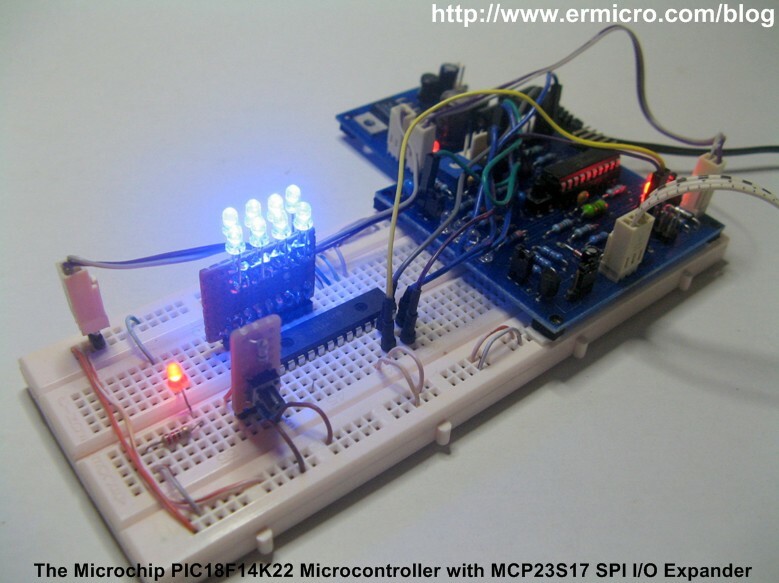 For the purpose of this tutorial we will use the Microchip MCP23S17 just as the ordinary input and output expander for the PIC18F14K22 microcontroller. The MCP23S17 is configured to use address 0x00 (address pins A0,A1, and A2 are connected to the ground) and the push button switch connected to GPB0 port will be use as the toggle button to start and stop the chaser LED display attached to the GPA0 to GPA7 ports. The following is the C code to achieve these tasks. For quick prototyping this project on the breadboard I used the SIL LED display and SIL push button modules which you could read more about it in my previous posted blog Single In Line (SIL) LED Display for your Microcontroller Project. The Microchip PIC18F14K22 microcontroller SPI peripheral actually is the part of Master Synchronous Serial Port (MSSP) modules inside the PIC18F14K22 microcontroller. Each module could be operated in one of the two modes: Serial Peripheral Interface (SPI) or Inter-Integrated Circuit (I2C). The SPI module could support both SPI master and SPI slave modes. For the purpose of this tutorial we will only focusing on the SPI Master mode. 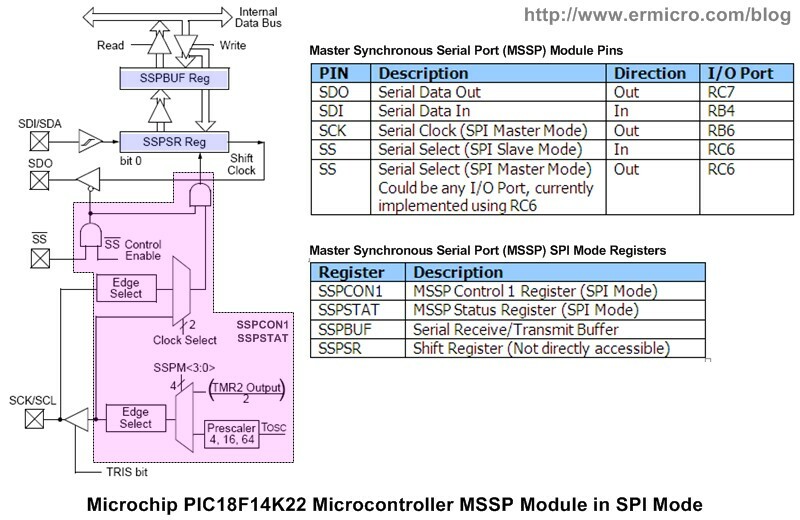 To initialize the SPI peripheral inside the PIC18F14K22 microcontroller we need to enable this device for SPI master and set the master clock frequency using the MSSP control register 1 (SSPCON1) and the SPI status register (SSPSTAT), for complete information please refer to the Microchip PIC18F14K22 microcontroller datasheet. The first thing before we could use the PIC18F14K22 SPI peripheral is to properly configure the PIC18F14K22 tri-state registers for the SPI master I/O operation; SDO (RC7) and SCK (RB6) as output port and SDI (RB4) as the input port, while the SS can be any port for SPI master operation but on this tutorial we will use the RC6 to select the SPI slave device. The following C code is used to set these SPI ports. 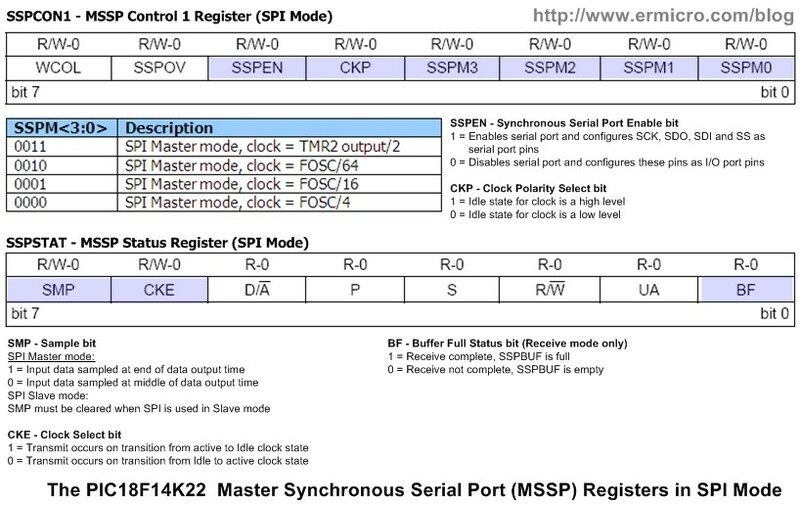 After initializing the I/O ports next we have to enable the PIC18F14K22 MSSP peripheral by setting the SSPEN (Synchronous Serial Port Enable) bit to logical “1” and selecting the SPI master clock frequency by setting the SSPM<3:0> (Synchronous Serial Port Mode) bits to maximum Fosc/4 (4 MHz) in the SSPCON1 register. The way the SPI data being transmitted or received is controlled by CKP (Clock Polarity) bit in the SSPCON1 register and CKE (Clock Select) bit in the SSPSTAT register. This behavior in the SPI world is known as the SPI bus mode, there are 4 SPI bus modes supported by the PIC18F14K22 MSSP module. Last is the SMP bit in the SSPSTAT register, this bit is used to control how we sample the input data. Setting this bit to logical “0” means we sample the incoming data at the middle of data output time while setting this bit to logical “1” means we sample the incoming data at the end of data output time. The most commonly SPI bus mode widely supported by many SPI slave chip are mode 0 and mode 3, the different between these two mode only on the clock polarity. Before we start the SPI master transmission to the SPI slave device, make sure we have to activate the SPI slave chip select pin and deactivate it after we finish transmitting the data. The complete SPI write and read algorithm is implemented in the SPI_Write() and SPI_Read() functions. 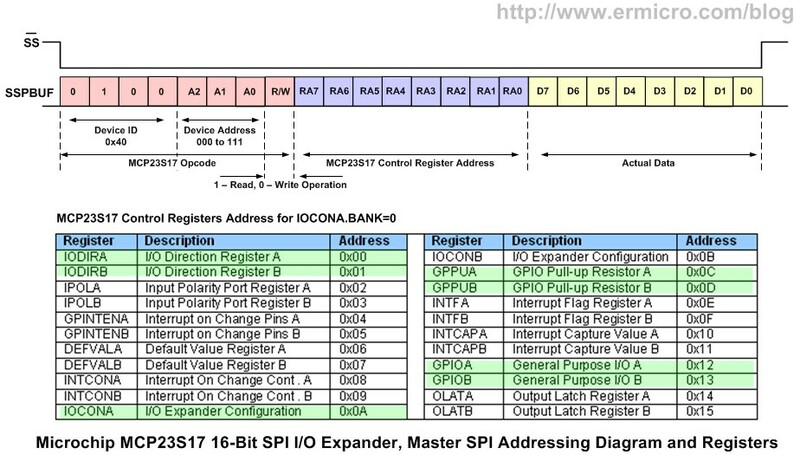 To write and read data from and to the MCP23S17 SPI I/O expander device, first we need to send a read or write operation code followed by the MCP23S17 register address then last is the SPI master data. The first 8-bit operation code data consists of the MCP23S17 device ID (0x40), address (0 to 7), and read or write operation command (1 or 0). From the addressing diagram above you could see that at least we need to perform three SPI master writing to send or read the data to or from the MCP23S17 SPI slave I/O expander. After configure the MCP23S17 registers, we entering the infinite loop where we simply read the MCP23S17 GPIOB input port and if the switch is pressed then the SPI master will start sending the LED display patterns to the MCP23S17 GPIOA output port. The LED display delay is controlled by the user’s trimport on the PICJazz 20-PIN board which connected to the ADC channel 3 (AN3), for further information about using the PIC18F14K22 microcontroller ADC peripheral please refer to my previous posted blog PIC18 Microcontroller Analog to Digital Converter with Microchip C18 Compiler. As I promised on this last tutorial we are going to turn the Microchip PIC18F14K22 microcontroller into a useful SPI slave chip testing device that could be used to test and debug almost every SPI slave chips in simple and easy way. The device is called the SPI to UART gateway as it take advantage of the PIC18F14K22 UART peripheral connected to the computer RS232/COM port (through the PICJazz 20-PIN RS232 voltage level shifter) to talk interactively with the SPI slave device. 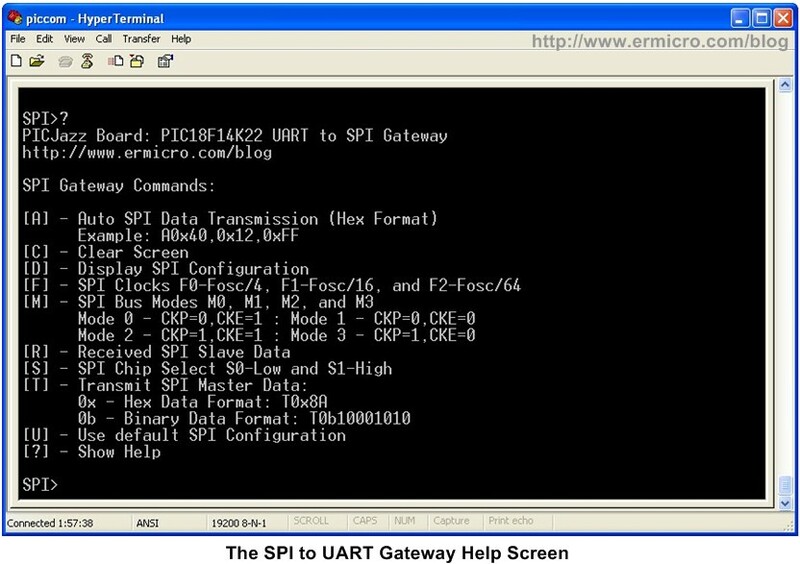 Basically the SPI to UART gateway is the embedded system application that allows us to send the command through the computer/PC serial terminal program such as HyperTerminal, puTTY, and TeraTerm to the SPI slave device (baud rate: 19200, data bits: 8, parity: none, stop bits: 1 and emulation: ANSI). // 0.16% Error for 16 MHz Oscillator Clock. Actual baud rate will be 19230.
uart_init() – initialized the PIC18F14K22 UART peripheral with 19200 baud rate for transmitting and receiving data. From the picture above using the automatic command (A), first we send three 8-bit data consecutively to set the MCP23S17 SPI I/O expander IOCONA (0x0A) with 0x28 for enabling the addressing mode. Remember that the first 8-bit contain the MCP23S17 device ID, address and write operation code (0x40). Next again we set the MCP23S17 IODIRA (0x00) to 0x00 to configure GPIOA as output and the last we send the data (0x11) to the MCP23S17 GPIOA port (0x12). Using the same principal we could easily read the MCP23S17 GPIOB (0x13) port (remember that first we have to initialize the IODIRB before reading the GPIOB port) using the interactive transmit (T) and receive (R) commands to send and read the data. As you noticed the first 8-bit data is 0x41 instead of 0x40, this is because we use the reading operation instead of the writing operation from the MCP23S17 GPIOB (0x13) port. 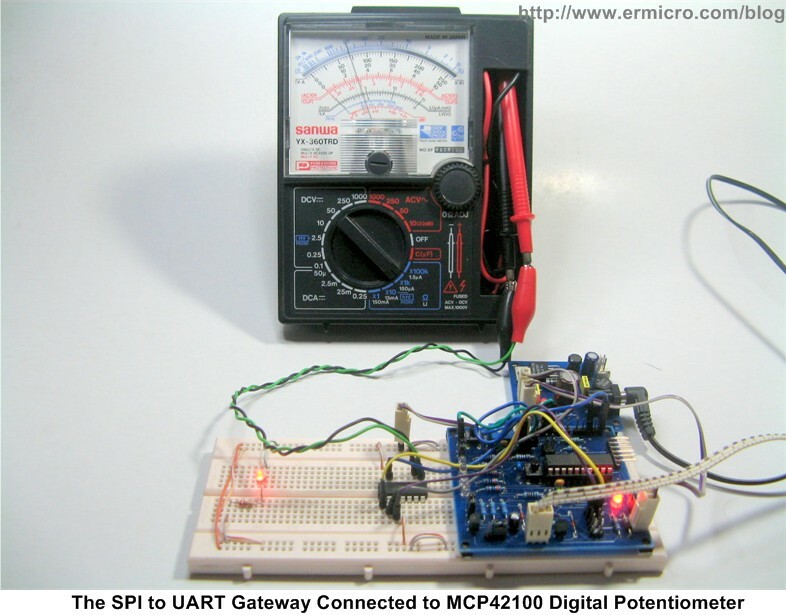 On the last example of this tutorial I will show you how to use the SPI to UART gateway application to control the Microchip MCP42100 digital potentiometer (100K). The basic connection to test the Microchip MCP42100 is shown on the schematic above; here I used the analog Ohm meter so you could watch the needle as it move. 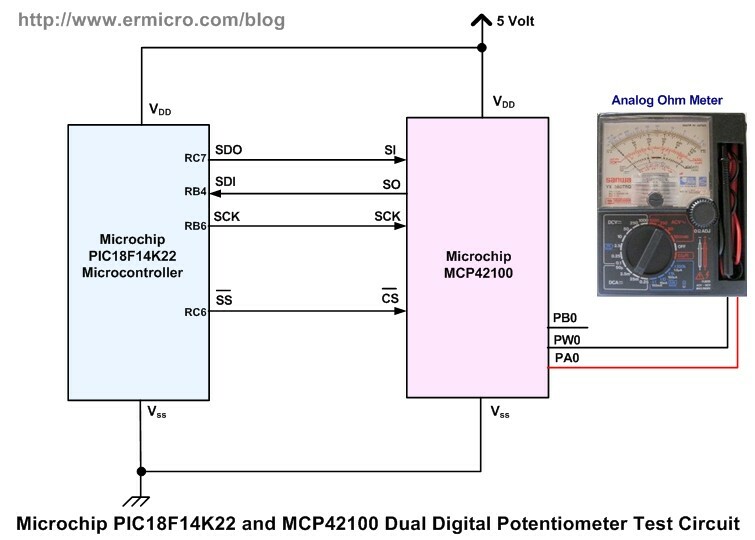 The Microchip MCP42100 provides two100K digital potentiometer where the potentiometer wiper could be control through the SPI interface in 256 steps. The first SPI to UART gateway command is used to activate the MCP42100 SPI slave chip (S0), next we send the command byte (0x13) to write to both potentiometer data registers follow by 0xFF to set the potentiometer data register. Last we deactivate the MCP42100 SPI slave chip by issuing the S1 command. The SPI to UART gateway program is designed to accept both upper and lower case commands. 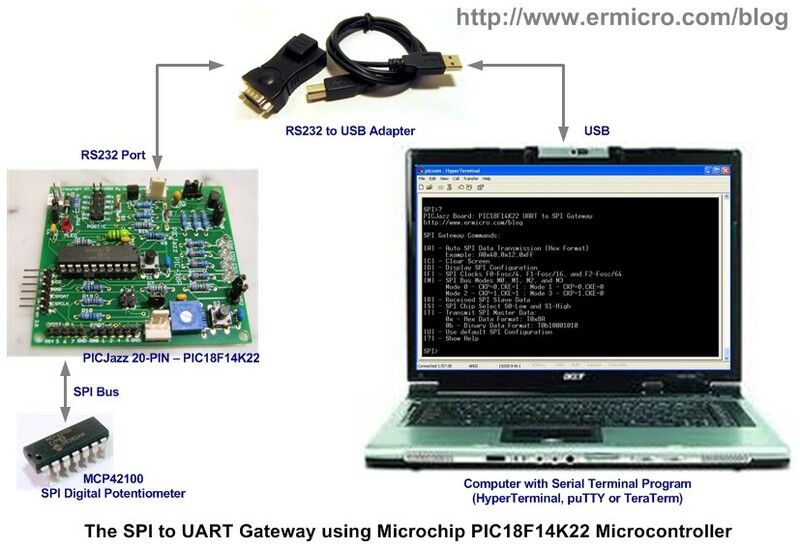 Now you could watch and enjoy the entire project presented here on this following video, where you could see how to use the SPI to UART gateway for testing both Microchip MCP23S17 SPI I/O expander and Microchip MCP42100 dual digital potentiometer. The Serial Peripheral Interface (SPI) nowadays is become a popular choice of the embedded system interface because of its simplicity and speed. On this tutorial you’ve learned to utilize the Microchip PIC18F14K22 microcontroller SPI peripheral to expand the I/O port and turn it into the SPI to UART gateway for testing and debugging the SPI slave device. In fact one of the well known open source commercial embedded system tools application called “Bus Pirate” (http://dangerousprototypes.com) is built based on this SPI to UART gateway idea (I don’t know who first started this idea) and they add more features on it to handle various embedded system interfaces such as I2C, 1-Wire, UART, PC keyboard, MIDI (Musical Instrument Digital Interface), etc. Hopefully what you’ve learned here could extend your knowledge to use various SPI slave device out there in your next embedded system project. Hello I want to use the “SMB380 digital 3-axis accelerometer” with the PIC18LF4520 microcontroller. As I understand then it’s not compatible with the 8-bit spi interface of the PIC? The SMB380 digital 3-axis accelerometer has 10-bit acceleration output resolution. For complete read the acceleration data output, you need two read cycles because the 10-bit data is split into 8-bit MSB and 2-bit LSB. The 16-bit protocol mention in datasheet is the protocol used to read/write the SMB380 accelerometer where the first 8-bit contain a read/write command (0 – writing, 1 – reading) follow by 7-bit address and the last is the 8-bit acceleration data, therefore you could use it with Microchip PIC18LF4520 microcontroller SPI peripheral. Like so the MCP23S17 use 24-bit protocol then? Very nice tutorial. I manage to use spi with the mcp23s17. Will try the second part “SPI to UART Gateway” later. First I must give my compliments to the forum. I would like to program in PLL with SPI interface “MB1501”. How do I send information from pic to pll 19-bit. I understand that I must send 8bit+8bit but how do I send the latest (3bit)? and then leads to high SS pin. In my program my CS output (RC6 for yours) goes high before my second bit is on the way (reviewed by logic analyzer). .. in fact my main loop has made it back to the top before the byte is sent. The SSPSTAT register specification mentions .BF is only used for receive only… have you confirmed that your chip select (RC6) actually is waiting to go high until the last bit of the byte is on it’s way? Mine appears that (!SSPSTATbits.BF) is true before the byte is finished. I’m not looking for support or help, I was just wondering if you had actually ever checked that?